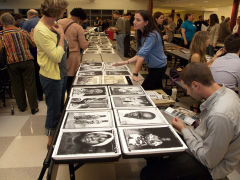 Last year we were introduced to the month long photo festival in Atlanta. With venues throughout town at museums, galleries and public spaces it is a great photography centric experience. ACP hosts an annual, citywide photography festival in October: the Atlanta Celebrates Photography Festival. The festival includes a wide variety of exhibitions and multiple events around Atlanta and throughout the surrounding communities. The festival’s diverse offerings bring together professional and amateur photographers, general art enthusiasts, gallery owners, critics, and collectors. Throughout the year, ACP sponsors additional community programming and opportunities specifically for the professional development of photographers. We will be there again this year starting next week.